Food and nutrition blogging is a great way to reach the masses, build your brand, and market your services. Today’s Dietitian shares insider tips on how to begin and become successful like the pros. When I began blogging for FoodNetwork.com’s Healthy Eats six years ago, few nutrition professionals knew what a blog was. Today, many of them maintain their own websites and food blogs that millions of people read and rely on for diet and nutrition information. Blogging in general has become a phenomenon, with 2012 statistics from The Social Skinny indicating that four of five Internet users visit social networking sites and blogs. Blogs related to food and nutrition professionals especially are popular. In fact, a recent BlogHer study found that almost 90% of the sampled population searched online for recipes. In addition, 73% of participants said they trust food blogs. With a high demand for food and nutrition blogs, it’s worthwhile for nutrition professionals to learn more about them and maybe even create their own. Food blogging can promote dietitians and their businesses, build their brands, market the dietetics profession, spread nutrition messages, and enable real-time communication with clients and consumers. Furthermore, it allows RDs to disseminate accurate and appropriate dietary recommendations, which less qualified health care professionals can’t do. Certain health care practitioners, such as chiropractors; physicians with little nutrition education; health food store owners or employees; personal trainers; and others in the health and fitness industry often post dietary recommendations well beyond their education and expertise. As a result, they can make potentially dangerous suggestions that may not be suitable for people taking certain medications or who have specific diseases. For this reason, dietetics professionals must step up and promote themselves as the experts the public turns to for food and nutrition information both on and offline. They’re most qualified to disseminate the appropriate information in a fun and engaging way to remind the public that healthful and delicious foods can go hand in hand to prevent and manage chronic disease and promote overall health and wellness. Whether a new or veteran food and nutrition blogger, this article will discuss the ins and outs of successful blogging to help dietitians fine-tune their skills from idea to publication. What’s important about blogging is the ability to regularly generate (post) new content to keep readers interested and coming back for more. It’s also key to determine how much time they realistically have to generate content and when is the best time to post material. High-traffic times are ideal and usually occur midweek. Readers are more likely to search for information right before they start their workday, during their lunch hour, and after dinner. Blog posts should be between 350 and 500 words to keep readers engaged. If a post is too lengthy, cut it down and link it to a previous blog post on the site or another credible source where readers can get more information. A lengthy post also can be divided into several individual posts to hold readers’ attention and give them a reason to revisit the site. Blog posts don’t just entail writing about food or nutrition. They can involve research, recipe development and analysis, contacting experts for quotes, editing, and photography. Posts should be written in a conversational tone. Draw in readers using humor and personal stories to make the content fun and relatable. Use contractions such as “don’t” and “can’t,” and colloquial language such as “bevvies” for beverages and “veggies” for vegetables. It’s important to set a schedule and organize topics. Generate ideas based on the time of year (eg, back to school, cold weather), holidays, hot topics and controversies in the news, and personal stories. Good resources for newsworthy topics include the Academy of Nutrition and Dietetics’ News Center, the Nutrition & Culinary Consultants Health and Wellness Smart Brief, listservs such as the Nutrition Entrepreneurs and Food & Culinary Professionals dietetic practice groups, and the Center for Science in the Public Interest. • Standard one-time post: These posts are written in narrative form in response to a news story (eg, new food safety laws), shopping trip, or personal experience (eg, a family trip to an apple orchard) and don’t require the same type of outline or format for each one. • Series: For an article series, such as a taste-test series on Greek yogurt or how to cook beef five different ways, it’s best to follow a standard outline or format for each post. This facilitates readability and provides a consistency that readers will like. • Recipes: Always create a standard format for recipes so that ingredients, instructions, serving sizes, and nutrition information are readable and easy to follow. Instructions can be numbered instead of bulleted, and the nutrition information can be written in the same format and order for each recipe. Don’t forget to include photos to draw in readers. After outlining the post, research the topic so statements are scientifically supported. Reputable sources include government websites, food boards, online journals, nutrition textbooks, food magazines, and books such as 101 Foods That Could Save Your Life by David Grotto, RD, LDN, and Food Lover’s Companion by Sharon Tyler and Ron Herbst. Publishing a recipe from another source without permission from the original owner violates copyright law. However, it’s OK to link the title and author of the recipe to its original website. To republish a recipe, it’s necessary to obtain permission from the individual or entity that owns the rights to that recipe. For dietitians who develop their own recipes, always test them before posting. This will help verify the serving size, weight of ingredients (for analysis purposes), consistency, and taste. RDs who regularly develop recipes should invest in nutrient analysis software (eg, Nutribase, Food Processor). Free online analysis programs are available, but they don’t have as vast a database as paid software programs. Free online programs use the USDA database that contains 8,000 foods, while paid software programs have up to 51,000 foods. Another option is hiring a fellow dietitian who specializes in nutrition analysis. The popularity of photo-driven social media sites such as Pinterest and Instagram has skyrocketed in the past two years, making colorful, high-quality photos a key component of a blog post. Dietitians can take and upload their own photos or purchase them online. For taking original pictures, it’s best to invest in a quality camera, use natural lighting, make the food the focus, and change the scenery by taking photos in different rooms or outdoors, says Dana Angelo White, MS, RD, ATC, owner of Dana White Nutrition and a fellow Healthy Eats blogger. Photos also can be purchased from websites such as iStockphoto.com and Photos.com. Once selected, it’s best to place photos at the top of the blog post to attract readers. Note that downloading photos to a blog from online sources without permission is considered copyright infringement. It’s important first to write a draft copy of a post in a Microsoft Word document to save it for future reference. Make sure to use unformatted text throughout. After completing the post, proofread and edit it for spelling and grammatical errors, and make sure the sentences flow well. It can be valuable to ask a colleague to review the post and provide feedback, and it’s a good way to partner with a fellow blogger. Once the content is complete, copy and paste the text into the “back end” and upload the photos. (Posting on the “back end” allows for previewing a post as it will appear to readers, making any spacing adjustments, ensuring photos are positioned properly, and scheduling posts in advance.) Once the post appears as desired, publish it immediately or schedule it to be posted at a later time. Be sure to allow comments and pingbacks to posts. Pingbacks are remote comments, and if enabled they can track who’s linking to a blog post. In addition, create three to four tags per post. Tags are a useful way to tell readers what a post is about, and it enables people to easily find content from the blog on search engines. • Add “share” icons to posts. • Link back to older posts, especially within the first paragraph. • Encourage conversation and comments. • Promote the blog via Facebook, Twitter, and/or Pinterest. • Send a weekly, monthly, or bimonthly e-newsletter that contains links back to blog posts. • Write guest blogs on other websites. • Develop giveaway contests in which a review of a product is provided and readers can win a sample by commenting on the post. When holding contests, randomly select one commenter to receive the offered product, for instance, and remember to disclose the product sponsor. In addition to driving traffic to the blog, dietitians can monetize it by becoming an affiliate for a particular company. They place a link on their blog that takes visitors to the company’s product and receive a percentage of sales. Sponsored posts are another way to monetize a blog. Under this arrangement, companies pay dietitians to write a post about their product, a newly released study they’re involved with, or other content. Last year the California Strawberry Commission invited me to its annual field-to-plate bloggers tour and sponsored me to write a post about my experience. Nutrition professionals also can advertise products on their blog and charge companies a monthly fee for space. This type of advertising often is reserved for those whose blogs have a high traffic volume. The advertised products should be in line with the dietitian’s philosophy. Reputation is associated with the companies and products displayed on a blog or website, so choose affiliations carefully. Another way to boost traffic is through online and offline networking. This is considered a big part of the blogging world because dietitians can build a good reputation within various circles. Networking with other RDs at professional meetings and participating in blogging groups can help forge future business deals. Social media is another tool for meeting bloggers. The most popular social media sites are Facebook, Pinterest, LinkedIn, Google+, Twitter, and YouTube. The Nutrition Blog Network is another venue that helps disseminate reliable nutrition information. “The Nutrition Blog Network is a one-stop shop for reliable nutrition information in the often not-so-reliable world of nutrition blogs,” explains Lori Fromm, MS, RD, the network’s cofounder and senior vice president and director of food and nutrition communications at Weber Shandwick. Joining the network means being an RD and meeting established criteria, such as blogging frequency and educational content. 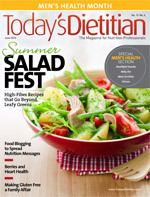 Dietitians can access an application at www.nutritionblognetwork.com/submit. Today’s Dietitian spoke with four blogging pros to discuss the success they’ve enjoyed through blogging, how they market themselves, and strategies for those who are just getting started. Helm is chief food and nutrition strategist at Weber Shandwick, the author of the blog Nutrition Unplugged, and cofounder of Nutrition Blog Network and Healthy Aperture. “I started Nutrition Unplugged in 2009 as an outlet for my nutrition writing,” she says. “I was a contributor to the Chicago Tribune, but I wanted to write more often, so a blog was a way for me to discuss some hot nutrition topics in between my monthly column. Scarlata is a Boston-based dietitian in private practice who specializes in digestive health. Through blogging, she has established herself as a FODMAPs expert and has been invited to speak at several conferences around the country. She’s received a significant increase in referrals and has been hired as an expert consultant for a book. —Toby Amidor, MS, RD, CDN, is founder of Toby Amidor Nutrition, PC (http://tobyamidornutrition.com), a nutrition expert for FoodNetwork.com, and a nutrition advisor for Sears FitStudio. Several free blogging services are available, the most popular being Blogger, WordPress.com, and Tumblr. These platforms are easy to use, so bloggers can begin posting immediately. When using one of these free blogging sites, hosting ownership belongs to the proprietor, not the blogger, so the blogger will have less control over the site and limited advertising options. One of the most popular paid blogging services is WordPress.org, which offers many more design and advertising options. This is a better choice for those who want more elaborate, dynamic blogs that feature interactive pages, recipe lists, and community chat boards.